IBM BigInsights on Cloud provides Hadoop-as-a-service on IBM’s SoftLayer global cloud infrastructure. It offers the performance and security of an on-premises deployment without the cost or complexity of managing your own infrastructure. Learn more about BigInsights on Cloud! 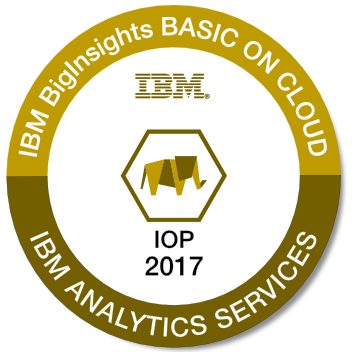 If you’re using IBM BigInsights, consider earning the IBM BigInsights on Cloud – IBM Open Platform, IBM BigInsights on Cloud – Text Analytics, IBM BigSQL, IBM BigSQL – Analyze Data, and IBM BigInsights BigIntegrate and BigQuality IBM Open Badges to share verified proof of your achievement.